Cover Art © Del Ray Books. Click to embiggen. Our good friend — and six-time James Bond novelist — Raymond Benson has just picked up an award at last week’s Love Is Murder mystery writer’s conference in Chicago. Sharing the “Lovey” with filmmaker John Milius, Mr. Benson won in the Paranormal/Sci-Fi/Horror category for the novel Homefront — The Voice of Freedom, based on the popular HOMEFRONT video game developed by Mr. Milius for THQ. America may be reeling from endless recessions and crippling oil wars, but hack reporter Ben Walker never expected to see his homeland invaded and occupied by a reunified Korea—now a formidable world power under Kim Jong-il’s dictator son. The enemy’s massive cyberattack is followed by the detonation of an electromagnetic pulse that destroys technology across the United States. Communications, weapons, and defense systems are rendered useless; thousands perish as vehicles suddenly lose power and passenger jets plummet to the ground. Fleeing the chaos of Los Angeles, Walker discovers that although America’s military has been scattered, its fighting spirit remains. Walker joins the soldiers as they head east across the desert, battling Korean patrols—and soon finds his own mission. Walker reinvents himself as the Voice of Freedom, broadcasting information and enemy positions to civilian Resistance cells via guerrilla radio. But Walker’s broadcasts have also reached the ears of the enemy. 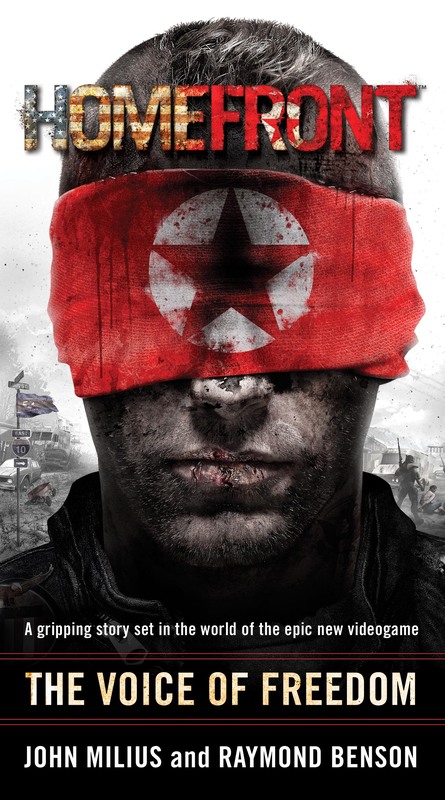 Korea dispatches its deadliest warrior to hunt the Voice of Freedom and crush the ever-growing Resistance before it can mount a new war for American liberty. On the off chance that you haven’t yet read it, Homefront — The Voice of Freedom is available at all fine booksellers, and from Amazon.com in several formats, including Kindle. HMSS extends its congratulations to Raymond Benson on the winning of his third “Lovey” award! PS: As a by-the-way, fans of his fabulous novel The Black Stiletto are in for a treat. Right now you can grab — for free! — a copy of his short story “The Black Stiletto’s Autograph” over at the SmashWords website. A sort-of prequel to the novel, this particular piece gives us a little back story, and a little additional insight, into the character of our favorite new costumed urban avenger. So, if you can’t wait for The Black Stiletto: Black and White to come out later this year, hightail it over to SmashWords to snag your free copy. They have it formatted for practically every platform in the world (including Kindle), so don’t worry if you don’t have an iNook or whatever.